You can find cheap car rentals that allow pets are in just about every city and town in the U.S. Some of the more well known are Alamo, Avis, Budget and Hertz. What you need to watch for is the cleaning fee. There are ways to avoid this however. Simply don’t allow your pet to damage the car’s interior. Besides being safer for traveling, a pet carrier will also make sure that your pet’s claws — no matter how short they are — won’t damage the leather or cloth interior. As an added precaution, you might want to purchase one of those very inexpensive fleece throws and place it under the carrier. This will help if the water in the carrier spills. You also want to make sure that you pick up most of the fur your dog sheds. It only takes a few minutes to do an extra swipe with a damp cloth to pick up the fur, which could save you a lot of money. We need to do our part to make sure that the pet friendly car rental agencies keep allowing our animals without hesitation. Cheap car rentals are only cheap if you don’t get charged for the extras that can incur if you don’t bring back a clean car. If this is your first time traveling, you may want to read this general overview of pet travel that includes pet friendly hotel information and traveling tips. If you are traveling throughout the U.S. and booking cheap car rentals that allow pets, Vacation Pet Friendly has a great selection with low rates. We often have special deals. One thing to keep in mind, you will be charged much more for your car rental if you pick it up without making prior reservations. Plus, many times, they can’t find the reservation so make sure you write it down where you can find it easily, even if when hurried. As far as ways to travel goes, traveling with pets by car typically is the best way to go. Most dogs have been in cars to visit the vet, groomer and even just for a ride to friends’ homes. If your dog is like ours, she will stand by the car as soon as she hears the keys jingling. If your dog is not used to traveling via automobile, then you might want to practice long before your trip–especially if your travel plans include long periods of being in the car. Make sure to bring along a portable water bottle or bowl, as first trips can make your hound nervous resulting in a dry mouth. If, on the other hand, your pet is used to being in a car, their should be no problem. Either way, however, you may want to stop by your veterinarian to pick up some anti-anxiety medications should a long trip be in the agenda. Also, here is a helpful video for traveling with pets in cars. Most agencies that have pet friendly cheap car rentals take into consideration that people travel with cats and dogs, so they typically allow for both. Cats, however, may be a little more skittish in riding in a car. If possible, get your kitty used to it early. If your cat is already grown, take short practice trips prior to leaving. If you are using a car carrier, place it in a room your cat frequents often and let him play around in it. This just gets your cat familiar with being in the carrier. We have many blogs with tips on traveling with your dog and traveling with your cat that you may want to read before setting off. Just for reference, here are the car rental agencies Vacation Pet Friendly thinks are great for traveling with pets. Alamo Rent-A-Car –Alamo is a pet friendly car rental agency that allows pets to ride in a car rental, however you must return the vehicles clean and free of pet hair so you can avoid paying additional cleaning fees. Avis Rent-A-Car — Avis is a pet friendly car rental agency allows pets to ride in rental vehicles, but again, if you want to avoid paying cleaning fees vehicles should be returned clean and free of pet hair. Budget Rent-A-Car — Housebroken pets are more than welcome to travel in a Budget car rental. Although Budget doesn’t charge extra for pets, owners will incur an additional fee if any damage caused by animals is discovered, or if any special cleaning is required because of shedding or accidents. Hertz Rent-A-Car — Hertz is a pet friendly car rental agency that allows domestic pets to ride in car rentals without an extra charge. However, pet owners will incur an additional charge for damage caused by animals, or if any special cleaning is needed resulting from shedding or accidents. National Rent A Car –Pets are allowed to ride in the vehicles. No additional fees are assessed. Pet owners/renters are responsible for damage caused by the animal, so to avoid cleaning charges, vehicles need to be returned clean and free of pet hair. Thrifty Rent A Car — Thrifty Rent A Car’s pet policies are different for every location. According to Thrifty representatives, most locations allow pets in the vehicles provided they are in a carrier. The party renting the car is responsible for any damage caused by the pet. 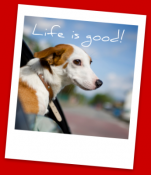 The vehicle needs to be returned clean and free of pet hair to avoid a cleaning fee. It’s best to call prior to booking online to ensure the location you are renting from accepts pets. Some only allow service pets. Being on the road with your pet, you don’t want any surprises. You may want to read some of our other articles that can help you along the way. Here is an overview of traveling with pets that we suggest. 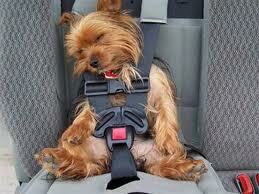 Vacation Pet Friendly wishes you a wonderful road trip with your pet.